The BAD4 is the multi-channel version of Burl Audios critically acclaimed B2 Bomber ADC. Pushing the boundaries once again, the Burl Audio B80 Mothership AD/DA converter has up to 80 channel capability. 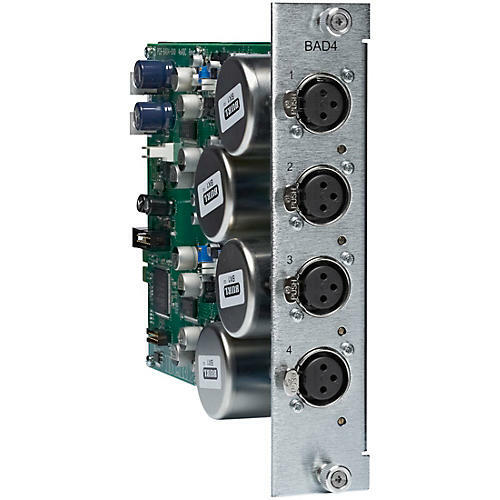 Using a card based system, and a heavy duty 4U chassis, the B80 Mothership employs 10 card slots with 4 channel AD cards, all with the B2 quality signal path. Every ADC channel has proprietary BX1 transformer on input. For many who have already embraced the B2 Bomber, this is a dream come true. Recording an entire band and playing back through 24 channels Burl at a time, is a truly beautiful experience. With a completely configurable AD/DA, a converter for any situation can be realized. If you track live, 6 BAD4 cards will give you 24 B2 quality inputs, and 4 BDA8 cards gives you 32 channels of outputs.